Under graduate– G.S. Medical College& KEM Hospital. Distinctions at II & III MBBS Examinations. Post graduate –G.S.Medical College & KEM Hospital First amongst candidates at MS exams at KEM. Lecturer - G.S. Medical College & KEM Hospital. A. Professor at K. J. Somaiya Medical college and Hospital. 36 Published research articles in national and international journals . Speaker at XVI IFOS World congress held at Sydney(1997) , Cairo (2002),Nairobi (2003). 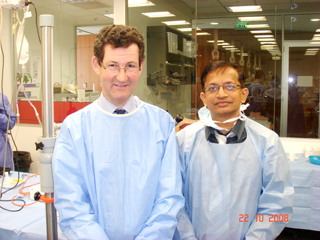 Organised the first Indo-Australian Cochlear implant workshop at Wadia hospital (1998). Also organised first rihnoplasty and facial cosmetic surgery workshop at bankok in Oct. 2010. Presented research papers at 16 national conferences.(1989-2009). Guest speaker at over 220 CME programmes. (1990-2009). Attended 8 in Kenya and Tanzania. Attended 11 in Gujarat , Rajasthan and Madhya pradesh. First teaching cassette (120 min) for students of ENT (1991). Operative cassette on LASER Surgery in ENT. Member of winning college team in Elocution, Swimming and Dramatics. TV programmes for Doordarshan , Metro, Zee and Care TV channels. Editor of GOSUMAG - college magazine . (1984 – 1989). Ethicon travel fellowship award of AOI in 1992 . Best Consultant paper award at AOI conference 2001 . Nominated as Top Doctors in ENT by India today for 2012 /13.